The incomparable Roger Lawson returns to the Callaway Theatre for a piano concert “Music From the 19th and 20th Century” on Tuesday, February 12 at 7pm. 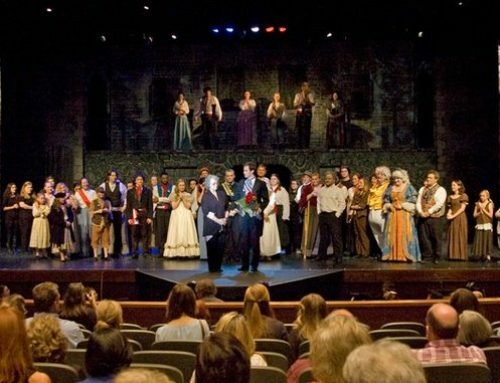 The one hour and twenty minute concert, with no intermission, is free and open to the public. A reception will immediately follow the concert, which is being sponsored by Charlie Thomas. The evening’s program includes the following works by some of the world’s most beloved Romantic composers; Albinoni/Giazotto, Schumann, Ravel, Mendelssohn, Granados, Chopin, Rachmaninoff, and Liszt. 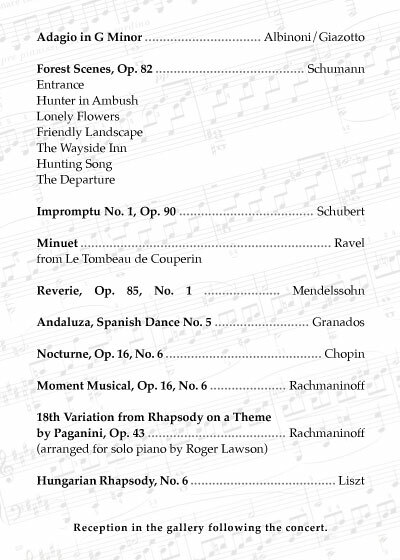 Included in the program are five new works, that Roger has never played in concert before. There are no tickets or need to make a reservation for the concert. All seating is open for the free concert. For nearly 50 years, Roger Lawson has been a local icon in the field of music education and piano performance. It was 1967 when Roger and his wife Jan decided to make El Dorado home. Roger had completed his undergraduate work at Louisiana Tech and received a masters degree in piano performance at Florida State University. He had taught at a junior college in South Carolina and at Georgia College for Women for five years, but was intrigued with the idea of opening a private piano studio, which he maintains to the present. “I began to investigate the area around Ruston because that is where I was from. At the time, El Dorado was really into piano. There were wonderful teachers here, so we decided to do it. We made the move, and we’ve been here ever since,” he said. For the next 30 years, Roger taught 60-70 students at a time, was the organist at First Baptist Church, and taught at South Arkansas Community College. “Oh man, everyone took piano then. It was just a high priority. We used to go around the state and participate in honor recitals, and El Dorado was very well represented,” he said. Many of those students have gone on to get music degrees and become very successful. Roger and Jan’s children, Mark, Lynn, and Christopher, who have pursued careers in fields other than music, were three of Roger’s outstanding piano students. “They had to ask me for lessons sometimes. They got lessons, but they were late at night or at odd times, and they had to fight for piano time to practice,” he said. Roger would readily admit that growing up in an environment of encouragement and support made the difference for him, too. His mother majored in church music, and he took piano lessons. When he was 14, he started taking lessons from a college professor, and he loved it. His family was extremely supportive. “My parents loved it. We went to Monroe and bought a Steinway,” he remembers. In fact, one of the two pianos in his home today was moved from his parents’ house in Ruston to his El Dorado home, and he fondly remembers and appreciates all of the help given to him by his own parents.